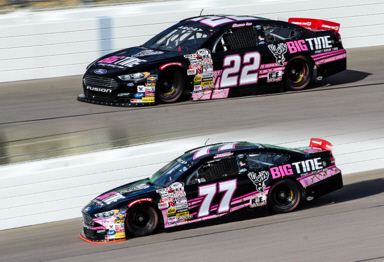 MOORESVILLE, N.C. (Oct. 24, 2017) – Closing out a successful season for Cunningham Motorsports, Shane Lee and Dalton Sargeant put on a show during the Kansas 150 at Kansas Speedway, both earning top-five finishes to add to their already impressive résumés. Lee and Sargeant battled back and forth within the top-10 contenders throughout the night to post an impressive fourth and fifth-place finish, respectively. Sitting sixth and reporting a loose car, Lee opted to make an early stop under a lap 17 caution for four fresh General Tires, Sunoco fuel and adjustments. Restarting 10th, Lee jumped to fifth on lap 27 and by lap 45 the No. 22 was sitting in third. At the halfway point, Lee came down pit road one more time under caution for four General Tires, Sunoco fuel and a slight track bar adjustment. Lining up fourth for the restart on lap 63, Lee swiftly bounced up to second until a battle with teammate Ty Majeski ensued, pushing Lee back into third. When the final caution fell on lap 85, Lee and the team chose to stay off of pit road. Starting second for the last restart with nine laps to go, Lee slid back into fourth for the remaining laps to earn his eighth top-five finish of the season. Making his way to the top five with just 10 laps complete, Sargeant reported battling a free car and began to lose positions. Coming down pit road under yellow on lap 17 for four General Tires, Sunoco fuel and adjustments, Sargeant restarted from the 17th position. By lap 30 Sargeant was back within striking distance, sitting seventh but still having trouble with the handling of his car. Returning to pit road on lap 54, Sargeant once again took tires, fuel and adjustments, lining up 12th for the restart. Breaking back into the top-10 with 32 laps to go, Sargeant chose to make his final pit stop with 15 to go. With just nine laps remaining, Sargeant wheeled his No. 77 Big Tine Ford from ninth to fifth for his 10th top-five finish of the season. You can follow Shane and Dalton on social media as well. Follow Shane on Facebook/Twitter (@ShaneLeeRacing) and on Instagram (@Shane_Lee00). You can find Dalton on Facebook (@DaltonSargeantRacing) and Twitter/Instagram (@DaltonSargeant).